My blogger pal Kimberly of RedShuttersBlog threw this challenge my way after she had been tagged by Phyllis of Napkin Hoarder who had been tagged by Casey of Life With Roozle who had been tagged by ….. well, you get the gist. So it’s my turn. If you know me, then you are less than six degrees from not just Kevin Bacon, but also Queen Elizabeth and Elton John. I wish I was a Latin ballroom dancer. I love anchovies and hate watermelon. I met my husband on a blind date. The introduction was via my brother. Who had met his wife on a blind date a decade or so earlier. That introduction was via me. Boom. You’re up next: Ben of DadoftheDecade, Lindsey of a Design So Vast, Tarah of Don’t Mind The Noise and, let’s send this thing international ….. Benedicte of Eugenie Street, Spencer of Stuff Happens and Sharon of Speed Skating Mom. I don’t have time to write a full recap about all that made BlogHer14 an amazing and thought provoking experience. Besides, so many of you have already written recaps that mirror much of what’s in my head and heart. So instead, I’m perusing the notes I took and the tweets I tweeted or retweeted – and listed below are the statements that impacted me most. Apologies in advance for not being able to attribute them or bungling them a tad — but know that your words were heard and felt. P.S. 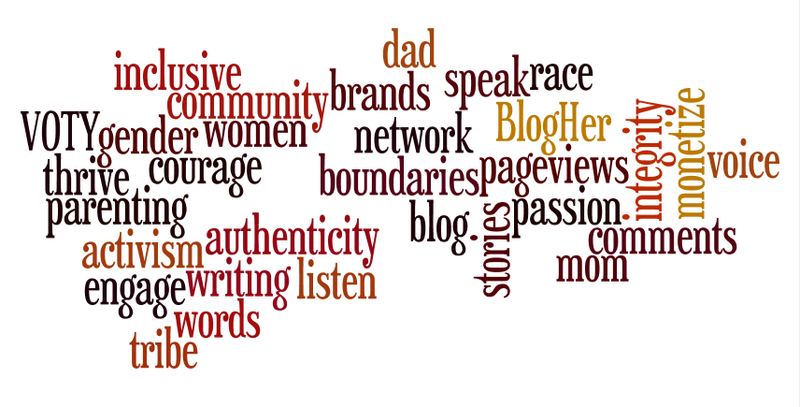 I write about the key takeaways from BlogHer for brands for my company’s blog. You can find it here. P.P.S. 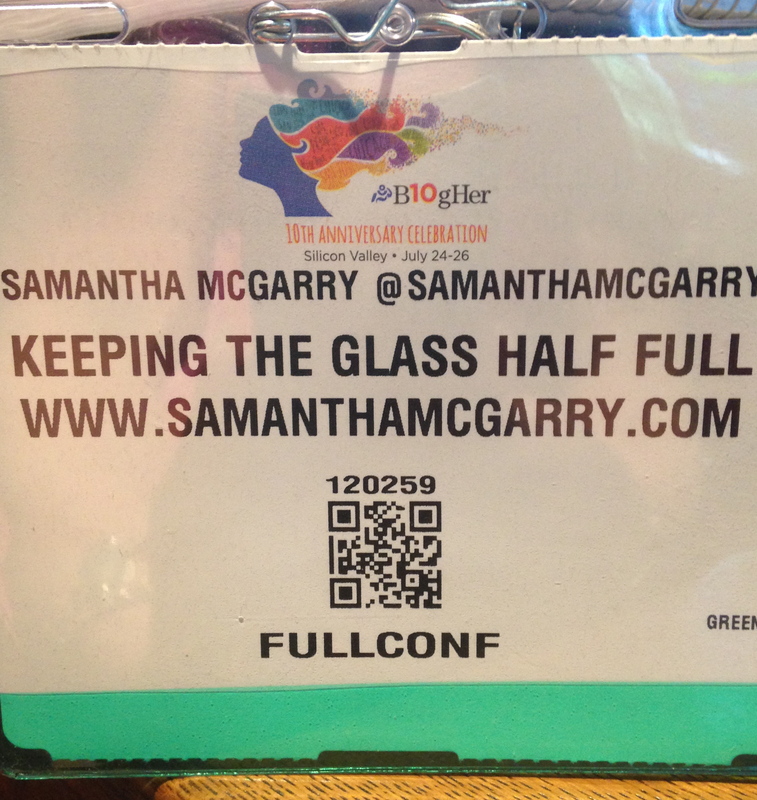 I also pulled together a Storify to highlight the tweets and images from BlogHer – it’s over here. As most of us who blog discover from our analytics, people put some strange search phrases together to find things on the internet. Aside from the stomach-churning searches for nocturnal activities (of which there are many), I also often find queries for advice on dadding (“single dad blog. too busy to eat breakfast”), searches for quotes and things to say on fatherhood (“dad eulogy” often appears), and queries for which I simply can’t understand how my blog could possibly be relevant (“waiter with dreadlocks” and “she said prison barber hair shorn”). And then there are the searches for “teratoma,” and variants thereof. It’s these people, anonymous through the internet, I want to find, and hug and do whatever else I can to offer some small measure of comfort. My daughter Emma was born in 2001 with a cervical teratoma – a tumor on her neck which was larger than her head. It protruded from her mouth, it extended down into her chest and attached from her heart, and it sat like a grapefruit underneath her chin. It nearly killed her, and she spent almost her entire first year hospitalized as a result. These search queries in my stats page are small digital prayers. They represent some terrified stranger, who has just received news that is far beyond their comprehension, and they are pleading into the information ether for salvation or information. They are suffering in a way I can understand more deeply than almost anyone else on the planet, and most of the time I feel powerless to do anything to help. I hope my writing provides some factual information and a lot of hope, but because of the anonymity of the internet, these deeply personal cries for help are beyond my reach to personally answer. Last week, I received an email from a mother of a girl who also has a tumor similar to the one Emma had. She talked about being isolated, and was largely reaching out for a connection from a very lonely and scary place—and it knocked me for a loop for a bit. It reminded me that what we write is read by actual people; that those search phrases bandied about have an individual behind a screen, looking for something to connect with. That, beyond the creeps searching for their jollies, there are stories, and there is pain, and hope, and love and loneliness yearning for something that maybe we can touch. It reminded me that we who write have a responsibility to those people behind the queries, that our words matter to someone, and that we had damn well better get what we’re trying to say right—and it reminded me that from my readers I can gain the connection that I seek as a writer, and as a dad. Here’s hoping that your queries find you the connections you seek in 2014! 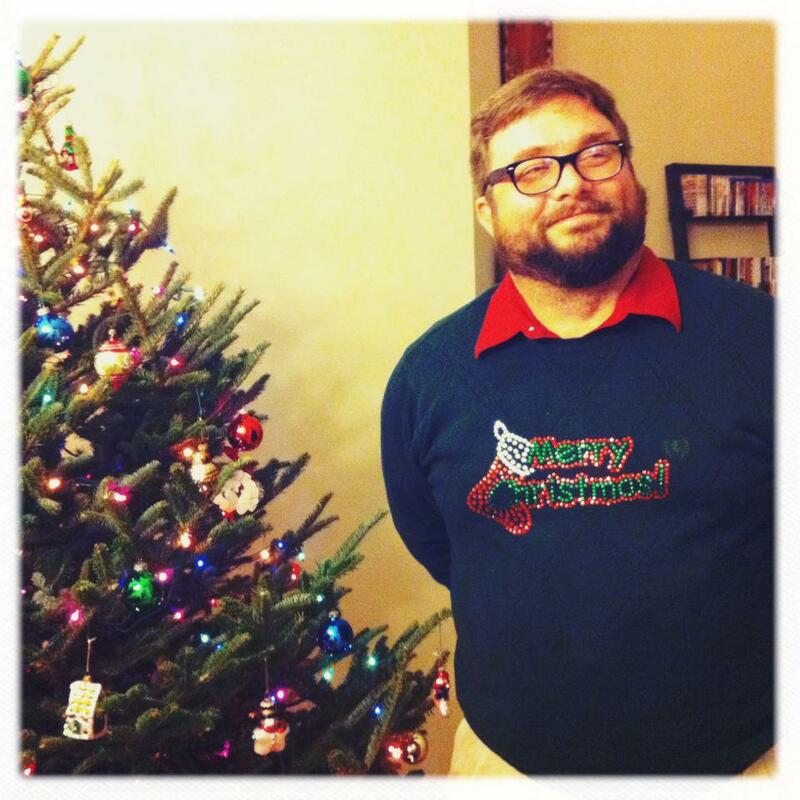 Ben Jackson is a father, blogger, publishing professional, creative writing student, and majestically bearded. From time to time, he has conned otherwise sensible editors into publishing his short fiction and essays. As an avid martial artist, one can often find Ben writing through bruises, slings and casts. You can read more of his writing at www.benfjackson.com or www.dadofthedecade.com. Although we try to keep our children as young as possible, they seem to have a mind of their own and desire to grow up faster than we’d like them to. As soon as he or she begins making friends at school, you child will undoubtedly start making plans for sleepovers. As a parent, there are many aspects of this innocent activity that you need to consider. Your child’s first sleepover will be the beginning of many and you should keep your wits about you during this social activity. 1. 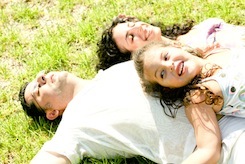 Your Behavior – You child isn’t the only one who needs to be on his or her best behavior. As an adult, we do and say a lot of things around the home that we can get away with. Why? Because we are adults and we can. However, you don’t want to scare away your child’s friend. Every parent has their own way of raising their children. What works in your home may not be ideal for another person’s child. Watch your behavior for it may put your child in an awkward position with his or her friend. 2. Meals – Find out from the friend’s parents which foods are ideal. You don’t want to inadvertently give them something they are allergic to. You don’t want to continue the sleepover in the emergency room. Make the child feel welcome in your home and provide his or her favorite dish. Even if it’s something you’ve personally never had before, it is a way to share culture with each other. You never know, you might find it to be a common delicacy within your home afterward. 3. Bedtime – You know that the children aren’t going to go to sleep immediately. Have some patience and provide a little leniency. The first sleepover is going to be the highlight of your child’s month and you can expect a certain level of excitement and hyper-activity to be going on. Don’t let the children use you as a doormat, but don’t be the sleep-tyrant either. Give the children a little slack especially if they are keeping the noise level down. Did you go to sleep immediately when you had a sleepover as a child? 4. Entertainment – Another aspect to consider is what kind of entertainment is acceptable for your child’s friend. While some households don’t see anything wrong with a family dinner watching “The Walking Dead,” some parents may be quite upset that you subjected their child to such television. Even video games should be monitored. Remember, not every household is the same and some don’t accept violence in any manner. Although it is your house, you should be respectful towards the wishes of your guest’s parents. It’s not your job to raise their child. 5. Privacy – It is possible to maintain vigilance over the happenings within your home without involving yourself in the play of your child and his or her guest. A periodic checkup is OK, but don’t try too hard to involve yourself in their activities. The children are having a sleepover, not you. It can be hard to let your child live their own lives without involving you, but they need to be able to establish their own path. The sleepover is a way of life and children have been engaging in this activity for a very long time. It creates bonds between friends and is a way to continue the play for an extended period of time. There is nothing to fear from these and after the first few sleepovers, your stress levels will diminish. Just try not to embarrass your child too much. Paul Taylor started www.babysittingjobs.com which offers an aggregated look at sites that help families find sitters and sitters find families easier than ever. He loves writing, with the help of his wife. When I started this blog back in December 2011, I promised myself that to make it entertaining, shareable and fulfilling, I would write a new blog post at least once a week, if not more. And for the most part, I’ve been able to do that. It’s never been a chore; at any given moment, I usually have a gazillion ideas for posts swimming in my head. I can usually find a quiet 15-20 mins over the weekend to write. Fortunately, I write fast, the words tumbling out of my head and onto the page. I frequently comment on other blogs and articles, especially where the topic is complementary to one of my posts and I can link back to it. Most of all, I’m not going to sweat it. I’m a working Mom and having it all is unrealistic. So if y’all have to wait another week or so for an awesomely witty or pithy or entertaining or educational or controversial post from me, then so be it! In two years, Mum and Dad will take you to see Les Miserables. It will change everything. Try sushi: you’ll like it! 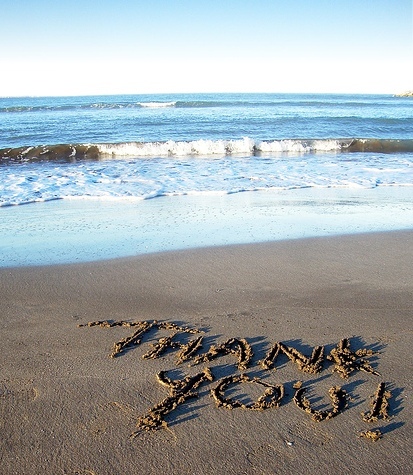 Last week, I started the process of taking stock of everything for which I am grateful. It’s an important exercise, stepping back from the daily grind and considering all that is good in your life. We should all do this much more often. It’s both sobering and uplifting. The teachers who taught my son to read. We spent five hours this weekend at Boston’s Museum of Science and my son’s new-found skill opened the experience up to him like I’d never imagined. It was fantastic to watch. My husband. Because he’s away on business and of course, it’s when he’s gone, I truly appreciate all that he does for me. Warms my cold feet in bed. Brings me coffee in the morning. Puts the trash out. Cooks dinner. Makes me laugh. Most of all, I love to step back and watch him interact with our kids in his unique, special way and miss that most when he’s away. My Mom friends. Thank heavens for other Moms. They just get it. Once a month, I get to hang out with a bunch of them and it’s like the best medicine for the soul. Humor: I was sent this video this week and it actually made me cry with laughter. Everyone needs a tear-inducing laugh every so often. Watch this and you’ll get yours for the week. Charity: This week I read about all the good works being done by so many to help the victims of Hurricane Sandy. When the rest of the world and news media had moved on, these people were still knee-deep in the collections and clean-ups. We should all be grateful for the work they are doing and the compassion in their hearts. Words and writing: this blog started out as an experiment, a fancy and has turned into a much more powerful vehicle for me. Somewhere I can write for me (as opposed to my writing for clients) and share my thoughts and words with you. This week I published my 100th blog post and crossed the threshold of 11,000 views, just shy of my one year blogging anniversary. Wow! Thank you all for indulging me.